If you’ve got the confidence to trade in a forex tournament, then you have to try out ForexBrokerInc’s ones. They give you a chance to win a chunk of huge prize pools! For example, their MT4 Tournament has a $10,000 prize pool and their VIP Status tournament has a $5000 cash prize pool! Stay awesome, FBI! ForexBrokerInc is founded in 2012 with headquartered in Belize/Malta, Europe. They are forex broker which provide to their clients comfortable trading conditions and a lot of bonuses. With them you can trade currency pairs(forex), indices, commodities, cfds and other. They have 24 hour live support, if you want to ask them for anything. The type of the broker is Non Dealing Desk ECN. If you open your account to them, you will receive a lot of news, tutorials, events, webinars, free forex signals, free technical analysis, economic calendars and outlooks. You can learn forex with their trading academy. They offer to their clients different account types – Metatrader 4, MT4 Mobile, Sirix WEBTrader, Mobile Trader and Mobile Platform. ForexBrokerInc minimum deposit is $100, you can deposit with payments methods such as Neteller, Wire transfer, Credit card and other. This broker is comfortable for every trader such as scalpers, intraday traders, long-term investors, Hedging traders, automated traders and other. You will receive FREE weekly forex webinars for beginners and advanced traders presented by their professional experienced traders. You can use leverage up to 1:500, so you can make a lot of money very fast, but the risk will be more. The spreads is one of the tightest at the market, so it is very comfortable for the scalpers. 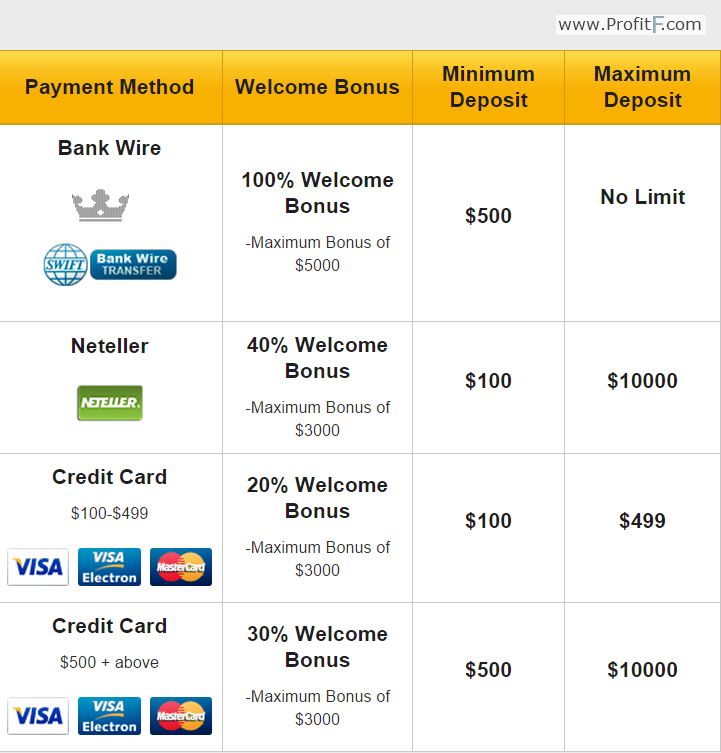 In order to claim the Welcome Bonus, new members must open a real trading account with ForexBrokerInc and make a minimum deposit as listed in the table below. Within 24 hours of your first deposit, our back office desk will automatically credit your account with a maximum bonus. 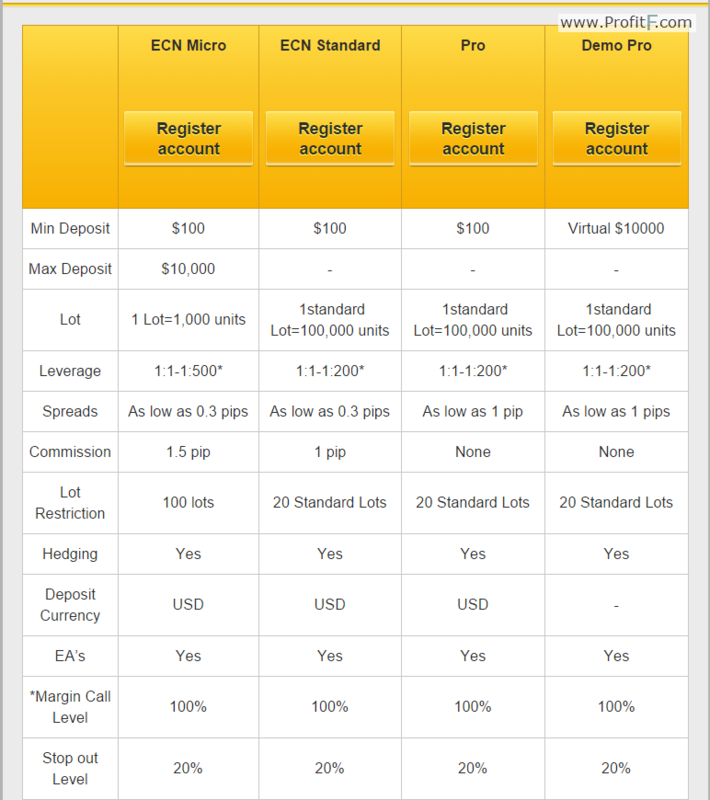 They have different account types with different trading conditions. So you may choose which of the account types will be comfortable for you.